Santa rides in a float during the 2017 downtown Christmas Parade. MOUNT GILEAD — The holidays are upon us and what better way to start than with a parade. The Morrow County Chamber of Commerce, Mount Gilead Public Library and the Downtown Mount Gilead Merchants are joining forces to kick off the Christmas season. Activities will be held at the Mount Gilead Library 5-7 p.m., and at participating downtown merchants 5-9 p.m. on Friday, Dec. 7. Parade will kick off from the Fairgrounds at 7 p.m. and travel north on Main Street. 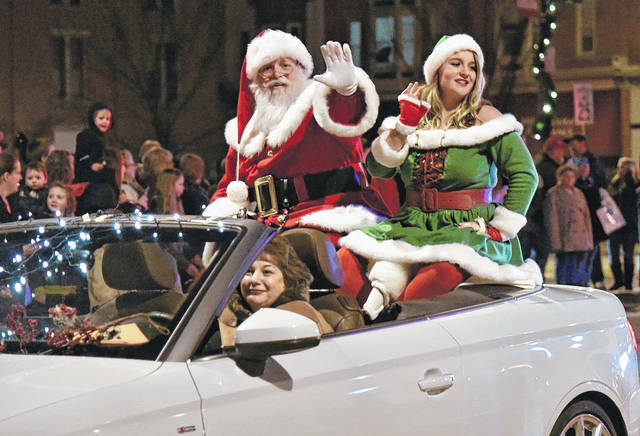 “You will not want to miss the spectacular display of lights during the parade,” Chamber Director Shelley Planey said. Also there will be music, participating downtown merchants will be open for business and the library will be hosting family-friendly activities. The evening will conclude with a tree dedication and candlelight service on the square. If you want to participate in the parade, contact LeAnne Gompf, parade coordinator, at 419-560-0351.